Geologic Maps: What are you standing on? Geologic maps: a few lucky geologists make them; many geoscientists, engineers, and planners use them; untold scores of people wonder what they are all about. It must be a puzzling sight – a lone geologist, often miles from the nearest road, looking at rocks, putting lines on a map or aerial photograph. One rightfully wonders what that person is doing. This online pamphlet answers these questions and points out the value and many uses of geologic maps. Looking at the landscape without a geologic map is like travelling in a foreign country without speaking the language. One can see many fascinating things, and perhaps even understand and interpret a few, but much of the deeper understanding inevitably lies shrouded in mystery. Without knowing French, for example, one can only guess at what is on the menu or what those standing next to you are saying (but it’s something important, you’re sure!). Even reading a foreign newspaper is an exercise in fultility. It is no different with geology. Without a geologic map in hand, reading and understanding the landscape – particularly its immensely long and varied geologic history, its resources, and its hazards – can only be done at a superficial level. Geologic maps graphically communicate vast amounts of geologic information – they are to a geologist what blueprints are to an architect, what a highway map is to a traveler, or what a photo-realistic painting is to an artist. Geologic maps display three-dimensional features on a flat piece of paper, with the added benefit of depicting the relative age, composition, and relationships among rocks and sediments at and near the earth’s surface. A detailed geologic map shows what it is you are standing on; where similar rocks or sediments may be found; how old they are; what they are composed of; how they formed; how they have been affected by faulting, folding, or other geologic processes; and what existing or potential mineral resources and geologic hazards are nearby. It would require volumes of text to describe what a geologic map can show on a single sheet of paper. It should come as no surprise then that geologic maps are the most fundamental and important geologic database for the earth sciences. They are the foundation for all other geologic studies. There are many types of specialized geologic maps – for example, those that focus on bedrock geology, structure, geologic resources, geologic hazards, or the geology of surficial sediments. Most maps produced by the Utah Geological Survey (UGS) give equal weight to each of these factors and so are considered multi-purpose geologic maps. 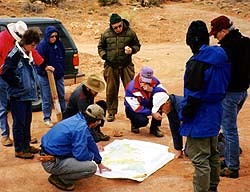 Geologic mapping is commonly confused with surveying. Surveyors, however, use sophisticated measuring instruments to make a base map of an area – that is, a map that shows roads, buildings, and other cultural features; rivers, lakes, and other waterbodies; topography; and other information. Maps that surveyors make include highway and street maps, maps showing property ownership, topographic maps, and many other types of maps. Geologic maps are also often confused with shaded-relief or topographic maps, which show hills, valleys, roads, and other features on the Earth’s surface. Geologic maps, however, use a combination of colors, lines, and symbols to depict the composition, distribution, and relationships of rocks and sediments at and near the Earth’s surface. Geologic maps are printed on a base map – which shows topography, roads, rivers, and other cultural and natural features – to allow users to accurately determine their location with respect to mapped geologic features. Geologic maps normally include cross sections or block diagrams that reveal the structure or arrangement of rocks below the Earth’s surface. Such diagrams give map users a glimpse below the ground surface and a better understanding of the three-dimensional arrangement of the rocks. Understanding this third dimension is particularly important for the discovery and assessment of mineral and energy resources. What is a Geologic Map Used For? A geologic map is the principal tool that geologists use to convey information about the structure and stratigraphy of the earth’s surface; the location and type of geologic hazards such as landslides and faults; and the location and type of resources such as sand and gravel, coal, ore deposits, and ground water. The myriad uses of geologic maps include their value as an educational tool to convey information about the geology, geologic hazards, and geologic resources of an area. It is a tool that can be used in many ways – from learning about the geologic history of an area, to natural resource and hazard assessment, to providing information for intelligent land-use planning and growth – and indeed, is as useful for its descriptive as well as predictive nature. Why are Geologic Maps Important? In addition to the many uses of geologic maps noted in the previous section, geologic mapping will continue to be important because it is cost effective. For example, looking only at the avoidable costs associated with the cleanup of landfills and industrial disposal sites, the Illinois State Geological Survey documented a benefit-to-cost ratio that ranged from 5:1 to 54:1 for geologic mapping. 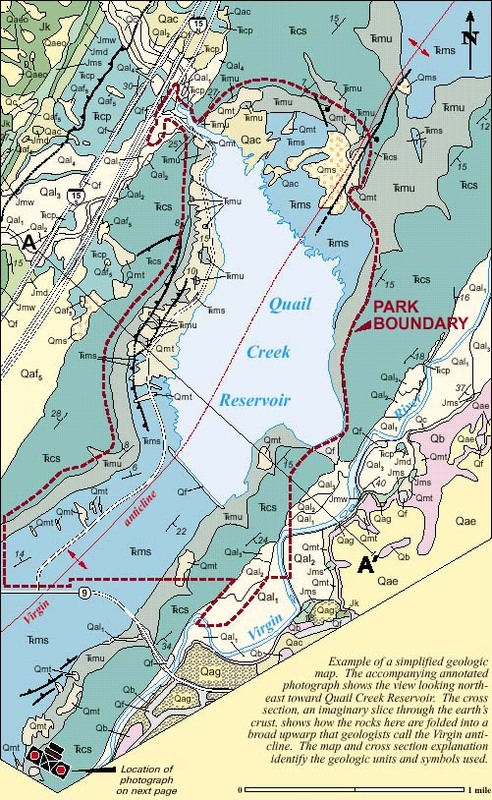 The U.S. Geological Survey also conducted a rigorous assessment of the value of new geologic mapping in Loudoun County, Virginia and found net positive benefits considering just two uses of the map information (for siting a new landfill and a new highway). Similar assessments in Kentucky show the benefit-to-cost ratio of geologic mapping there to be 50:1. Rigorous benefit-to-cost studies have not been done in Utah. However, a single example here points to the value of geologic maps. We know, for example, that new geologic maps of the St. George area more accurately show the location of the region’s infamous bentonite clay (known locally as “blue clay”), which is responsible for numerous foundation problems, and other geologic hazards that engineers and planners are now addressing. Given the myriad uses to which a map is put over its lifespan, the true benefit-to-cost ratio of geologic mapping must be greater still. On the flip side of the coin, the failure to use geologic maps or understand the geology of an area can lead to a variety of adverse land-use impacts: from catastrophic failure of dams such as the collapse of Quail Creek south dike in Washington County on January 1, 1989; to ground-water contamination at countless thousands of sites across the nation; to literally paving over valuable sand and gravel deposits needed to sustain urban growth, just to name a few. Hasn’t It Been Mapped Before? Depending on their scale, geologic maps vary in detail. A map where one mile on the ground is represented by 2.6 inches on the map shows more detail than one where a mile on the ground is represented by just 0.6 inch on the map. These two map scales are the most common scales used for what is considered large- and intermediate-scale mapping, respectively. Map scales are also expressed as a dimensionless ratio, such as 1:24,000, which means one unit of length on the map equals 24,000 of the same units on the ground. While Utah has been mapped at small scales (big areas with limited detail), large- (1:24,000) and intermediate- (1:100,000) scale mapping is lacking for many areas. The UGS’s Geologic Mapping Program focuses its efforts on publishing large- and intermediate-scale geologic maps, the same scales as the popular U.S. Geological Survey 7.5-minute and 30 x 60-minute topographic maps. The 7.5-minute map – which covers 7.5 minutes of latitude by 7.5 minutes of longitude, or about 55 square miles in Utah – is the standard scale for detailed geologic mapping, where one inch on the map represents 24,000 inches, or 2,000 feet, on the ground. Maps of this larger resolution are needed today to respond to a variety of environmental, resource-availability, geologic-hazard, and planning questions. It is also important to note that geologic maps are not a commodity that can be ordered up in a short period of time. The geology of many areas is very complex and commonly requires years of study to understand and map. Geologic maps are built on a long history of previous geologic investigations and typically take months or even years to produce. Geology, like other sciences, is evolving. Geologic maps can become obsolete over time, not because the geology changes, but because our understanding of it increases. Mapping often is refined as new geologic information becomes available. What Do All Those Lines, Colors, and Symbols Represent? Each of these map units provides important clues to the geologic history of the region, and to nearby geologic resources and geologic hazards. The photograph below shows the Virgin River (at extreme lower right) and associated floodplain sediments (Qal1). Here, the Virgin River has eroded into the Kayenta Formation (Jk), which reveals rock layers tilted to the left. The Kaytena beds are overlain by a remnant of a much younger, nearly horizontal lava flow (Qb). Old river gravels (Qal3) now form a high terrace to the right, and talus (Qmt, angular blocks that tumbled downhill) covers much of the steep slope below the lava flow. As for all those bright map colors and strange symbols, well, think of them as geologic shorthand. 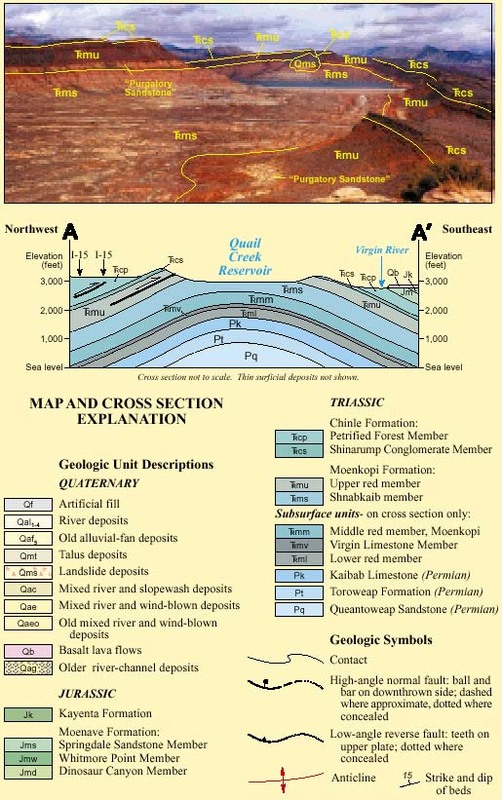 They may appear cryptic, but each geologic map is accompanied by a chart that explains what each line, color, and symbol means. Each map color, for example, represents a unique map unit – a group of rocks or sediments sufficiently distinct in age, composition, or environment of deposition so as to be differentiated from all other map units. By tracing map units across the countryside, geologists can locate earthquake faults, folds, and other geologic structures. Each map unit is also identified by a unique symbol. The first letter of these symbols is capitalized and denotes the age of the unit, while subsequent lower-case letters identify the name of the map unit. 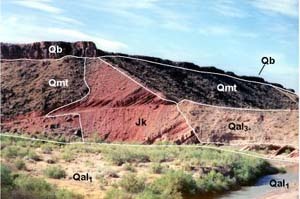 The symbol TRmu, for example, is shorthand for the Triassic-age (TR) upper red member (u) of the Moenkopi Formation (m), a sequence of red mudstone and fine-grained sandstone deposited in a tidal-flat environment about 240 million years ago. Other lines and symbols on a geologic map provide information on geologic structures such as faults (normal and thrust), folds (anticlines and synclines), and the orientation (strike and dip) of rock layers, among other things. How is a Geologic Map Made? To make a geologic map, geologists roam the landscape, plotting the location of geologic contacts, faults, folds, and other features on aerial photographs, or, occasionally, directly on a topographic base map. Aligned pairs of aerial photos give the geologist a three-dimensional, birdseye view of the landscape, greatly facilitating fieldwork. Back at the office, information from these photos is digitized and the final geologic map is edited and printed. New field methods are being developed for computerized data capture, but in the end there is no substitute for careful geologic fieldwork. In trying to explain the process of geologic mapping, one of my favorite analogies is to compare it to putting together a puzzle. To stretch the analogy even further, consider it a three-dimensional puzzle that is missing many pieces, and that is already out of its box (which has, much to your dismay, been thrown away!). You have no picture to refer to, so you start to scan the pieces, becoming familiar with their colors and patterns and perhaps developing an idea of what the picture may be. In geological parlance, you are doing reconnaissance work, becoming familiar with the rocks and their distribution and perhaps even formulating a working hypothesis as to their overall three-dimensional structure. Next comes the slow process of piecing things together until patterns and finally a coherent picture appears. To do this, the geologist of course doesn’t move outcrops around like the pieces of a puzzle. Rather, geologists map distinct groups of rocks or sediments. By plotting the boundaries, or contacts, between these map units on a topographic map or aerial photographs, the geologist eventually creates a picture that shows the distribution of rocks and sediments. This “picture” is the geologic map. It may reveal that the rocks have been faulted or folded. It shows the location and type of geologic resources or geologic hazards. Even the sequence of events that lead to the present landscape can be deciphered by examining the relationships among map units. As with our imaginary puzzle, however, the geologic map (our “picture” of the landscape) is nearly always incomplete. 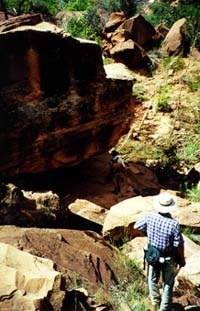 Rocks are commonly incompletely exposed or may have been eroded away. In either case, the geologist must interpret the rock record that remains, making an educated guess as to the true distribution and relationships among rocks and sediments. While many pieces of the puzzle may be missing, geologic maps provide our best window into the landscape’s foundation. Societal Value of Geologic Maps, by Richard L. Bernknopf and others, 1991: U.S. Geological Survey Circular 1111, 53 p.
Geologic Mapping for the Future of Illinois, 1992: Illinois State Geological Survey Special Report 1, 49 p.